Over the past year I have been busy running private and group courses for those who are seeking to enhance their love of photography, or just starting out and wanting to get the most out of their digital camera and build up their skills. 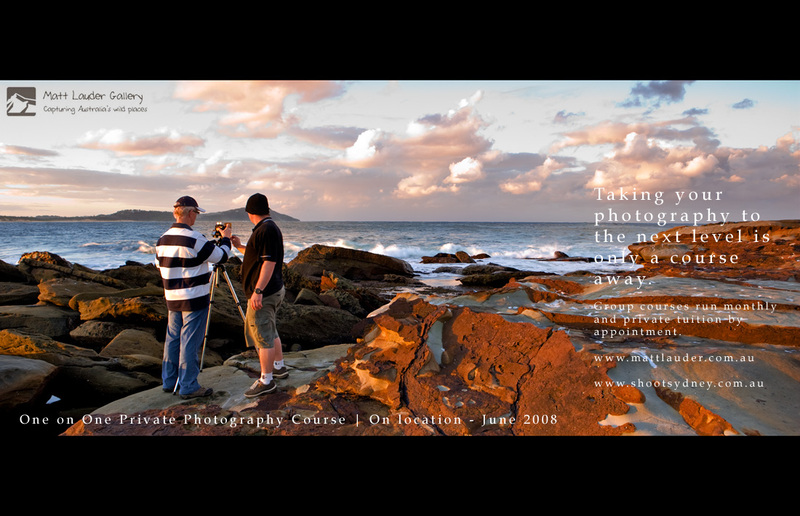 I have run courses for people who have had a simple point and shoot to the top of the line digital SLR. What I love most about running these courses is watching the students skills grow during the day and the excitement from the images they are capturing as they put into practice the skills taught. With a sturdy hand shake (even a hug one time) and a sincere “Thank you” at the end of the day and my job is now done and another person is ready to capture and explore the depths of the Australian landscape and places beyond. ” Having been a keen photographer for some time, I held professional landscape photographers in awe bewildered by their outcomes. Getting close to those standards seemed unobtainable. I was given a one day course with Matt as a present. I had no idea what to expect, but was confident that at the end of the day I would be a better photographer, but suspected that the difference would be minimal – after all how much could I learn in just one day. Matt immediately assessed my photographic skills, and structured the day to my abilities. Fundamentals that I understood, but not fully appreciated, were explained and demonstrated. Within the first few minutes I became a better photographer, and the improvement continued. By the end of the day I was shooting landscapes at a standard that I thought was beyond my capabilities. Very importantly I can now take a great photo in all sorts of conditions, no longer concerned that changing weather conditions will compromise my photographs. How much did I learn in one day? Well, far more than I ever anticipated. Take the plunge and do a course with Matt, you will not be disappointed, and enjoy the accolades from family and friends about your photographs. This entry was posted in Archives, Uncategorized and tagged Digital Landscape Courses, Landscape Courses, Landscape Phtography Course Feedback, Private Landscape Photography Tuition and Courses. Bookmark the permalink. Great stuff Matt! It must be very rewarding hearing what your customers have to say. Looks like you had some great weather for it too.